For the past two years, the trade deadline has been a frenzy of trades. West teams tried to make clear moves towards rebuilding or creating cap space while East teams tried to add as much firepower as they could. For the West teams, it’s a simple move. Try to build up your roster for the future. There’s no use trying to make marginal moves, those kinds of moves won’t work when you end up meeting the Warriors in the first round. So, might as well stock up on draft picks and cap space for the future when the Warriors hopefully break up. For East teams, it’s all about adding as much firepower to match-up to the Warriors. This year, the East turned into an arms race with teams adding key players and borderline All-Stars. The idea is that they’ll be fully equipped to face Golden State when they do get out of the East Playoffs. But even that may not matter. The Warriors are in a totally different class, especially with DeMarcus Cousins finally healthy enough to play. They’ve won nine of the 10 games that Boogie has played in. They’ve also won 15 of their last 16 games to reclaim the top spot in the West. Take today’s game against the Heat for example. Miami looked like they were well on their way to a surprising blowout win. Miami went on a 24-2 run to build a 19-point lead. Everything was going well for the Heat. Josh Richardson was on fire, Hassan Whiteside was dominant inside and Justise Winslow was running the show. 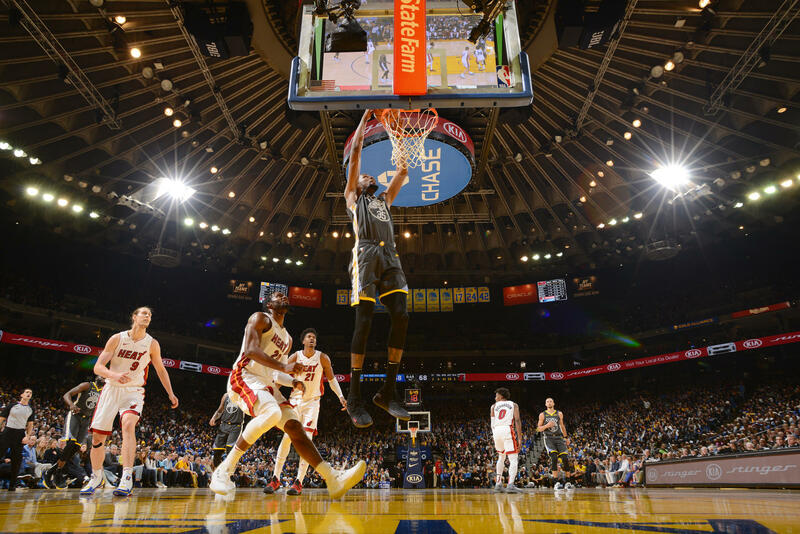 But that 19-point advantage began to evaporate as the Warrior All-Stars took over. They were down by only 10 after the first period and five by halftime. After their patented third quarter barrage, The Warriors eventually took the lead. They still needed a strong closing effort from their best players. The Heat got clutch stops and buckets from Richardson and Dwyane Wade to push Miami ahead by three. That’s when Kevin Durant struck. He nailed a three-pointer to tie the game. The Warriors got a stop and went to Durant once again for the win. He missed his shot but Cousins grabbed the offensive board and was fouled. He sank both free throws to get the win. Durant finished with 39 points six rebounds and four assists. Klay Thompson scored 29 points on six treys and Steph Curry had 25 points on five treys. This game once again proved that even if you play almost perfectly, the Warriors can still overcome all that with supreme talent. The Lakers were coming off a huge win over their rivals the Celtics. After hitting rock bottom a few days before the trade deadline, they were flying high after Rajon Rondo nailed a game-winner in Boston. Things were looking up for the Lakers. Magic Johnson was even ready to hug it out, Entourage style to smooth things over with the players he was supposed to trade. They had a few days off and were looking to string together a win streak against the Philly. Unfortunately, LA couldn’t keep momentum going. Joel Embiid and the Phantastic Five steamrolled the Lakers en route to scoring 143 points. Embiid finished with 37 points and 14 rebounds, dominating the Lakers front line. JJ Redick continued his hot shooting with 21 points. Tobias Harris had his best game as a Sixer with 22 points. Jimmy Butler had an efficient 15 points. The other end of the trade deadline is working well for Philly. They’ve now won three straight games, including back-to-back games with Harris on the team. They’re only a game behind the Pacers for the third best record in the East and have gone up a full game over the Cetlics in the standings. If Philly can gain momentum heading into the Playoffs, it’s not a farfetched idea for this group with asolid mix of young studs and proven veterans to come out of the East. A couple of rookies showcased their promise in separate games today. The favorite to win Rookie of the Year, Luka Doncic put on a show in Dallas. He finished with 28 points, nine rebounds and six assists. He played big in the clutch to lead the Mavericks to a big win over the Blazers. Marvin Bagley is finally gaining traction. He scored a career-high 32 points to go along with seven rebounds and two blocks. The Kings are making a Playoff push and all their young guys are going to play a key role for the rest of the season.